Hardware systems for generating MIDI output from guitars are often expensive, impractical and unreliable. Jam Origin’s revolutionary software alternative is none of these things. I just can’t think of any reason, save prejudice or poverty, why a computer‑owning electric guitarist who wants to experiment or simply needs to transcribe his or her playing wouldn’t buy this program. If you’re a guitarist who owns a computer or iOS device and an audio interface, Jam Origin’s MIDI Guitar is an essential trial download and an inevitable purchase. Go for it! 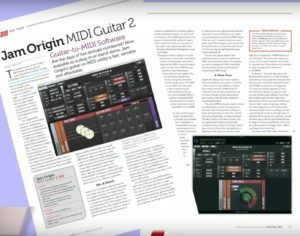 There’s not many products that make Toby Pitman swear out loud in sheer amazement when he first uses them, but Jam Origin’s MIDI Guitar software is definitely one of them! The concept behind MIDI Guitar is so simple and brilliant that I thought it was a hoax at first. Just plug your guitar in your audio interface with a 1/4” jack, launch MIDI Guitar and that’s it! You now have a MIDI guitar! No special pickups. No 13 pin sockets. No pitch to MIDI converter hardware! Just a lead!! So I downloaded a demo. I plugged in the guitar to my Apollo and launched the software and then loaded a synth in Logic. I then started to play. Did it work? Hell yes it worked!! Now I’ve owned a few MIDI guitar setups and never been all that satisfied with them. They’re a pain! This however was a total breeze and some of the best tracking I’ve ever come across. One dream of many guitarists have always been to be able to play the sounds of synthesizers with a guitar. In the past some (such as Pat Metheny and Scott Henderson) did so thanks to a special hexaphonic pickups from Roland to capture notes from each string and the transform the impulses to discrete MIDI … finally a brand new system that allows decoding polyphony from guitars with a standard jack and have a polyphonic MIDI signal without the use of special pickups or external synthesis modules . This technological wonder is called MIDI Guitar, produced by Jam Origin. 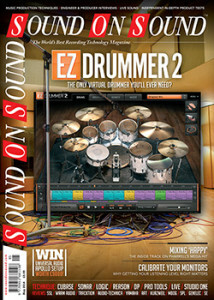 With this system you can play any instrument plugin inside your DAW or standalone without experiencing lag. The app is a virtual gem that will unlock new ways of sonic expression for guitar players.. for the price it’s a no-brainer! The JamOrigin website says: “Accuracy and latency results comparable to hardware solutions.” So I checked on my system and the measured offset between the pluck and the MIDI-note at 128 samples to 25 ms, no matter what sound on which string is played. For comparison: the Axon AX-50 manufacturer claims latency of 13 ms [for their hardware solution], however these values are not achievable in practice. The first rash of the waveform of the audio signal until the MIDI-note are 38 ms for the low E-string and 11 ms for the high E-string [for the Axon hardware]. Getting Guitarists to adopt guitar synthesizers has been an uphill battle for decades, but Jam Origin has come up with a new and much easier way for guitarists to access this world. 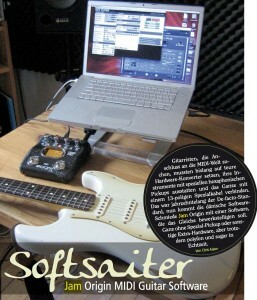 Merely plug your guitar into a computer or iOS device through any audio interface and MIDI Guitar lets you control almost any soft synth. I spent hours creating ambient, rhythmic, and melodic landscapes with a minimum of false triggering. I could also send velocity information by varying my pick attack, creating some cool virtual string slides within Reason’s upright bass sample. 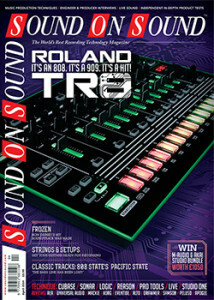 I’ve been obsessed with modelling and MIDI systems for guitar, used, sold, extensively tried and refrained from buying. The modelling stuff never sounded as good as real guitars on tube amps, and the MIDI stuff was inconvenient to use and required hardware guitar modifications. In addition, of course I could only use a guitar that I had fitted in accordance with such special MIDI pickup. With ‘MIDI Guitar’ I take any of my guitars, they connect using a normal phone cable with my audio interface and can play VST instruments, I already know and I do not have to incorporate laboriously.The price of such hardware solutions is many times higher than the price of ‘MIDI Guitar’. I’m thrilled! Jam Origin made a fantastic entry on the music software market… The software works perfectly and is great fun. And the price is very low. As to my knowledge there is no comparable product, a very strong buy recommendation. Also the customer service is outstanding: Our inquiry was answered within 14 minutes – on a Sunday evening! Yes, now I’m a keyboard player. And how am I playing my keyboard? With a guitar of course. So, I had never heard of this company and this plug in before, but now I know them. And now you also know them. Share the knowledge, my dear fellow guitarists! This is a real revolution in the world of synthesised guitar / MIDI. 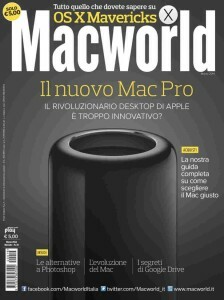 … this can be the gateway to guitarists and guitar students – and also bass and violin – into a new universe of music on your computer.